Contenders is pretty much Panini's answer to Upper Deck's SP Authentic line which came out last week. Contenders has made some good headway in closing the gap between the two brands these past couple of years. It's sad that this will be the last Contenders set we'll see for a while, but it looks like Panini has really made this one the best yet! IT IS LOADED. 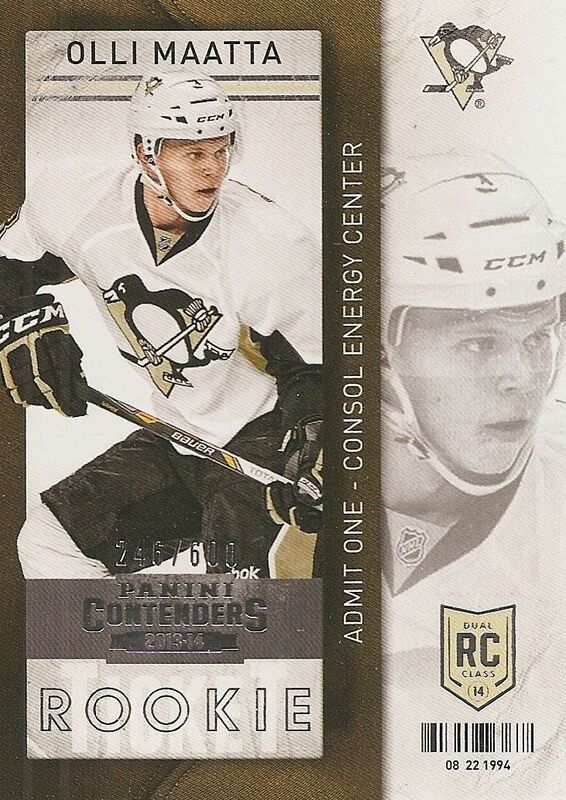 Contender base cards have their own specific design that they utilize - a ticket. The cards make great use of color and space. Framing the main player photo with the team color works well, and the addition of the monotone close up photo adds a nice dimension to the card. Silver foil is used on these base cards sparingly. 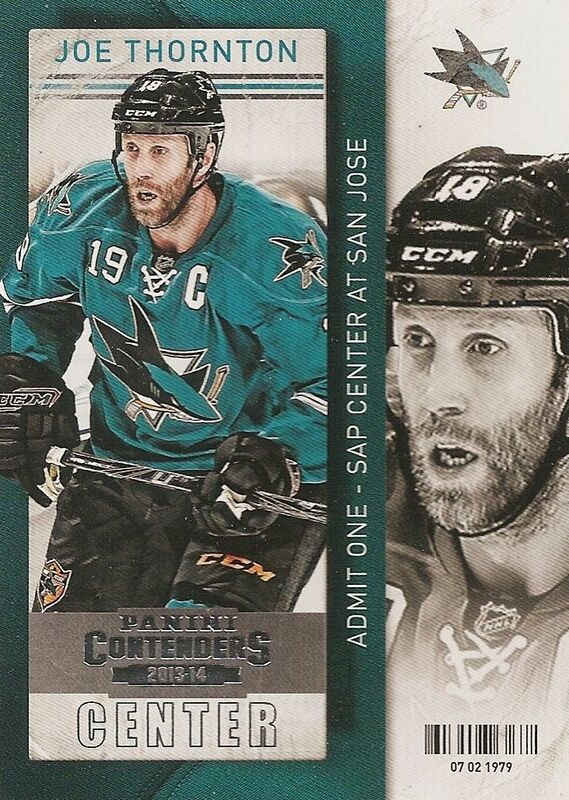 You'll see foil used only at the bottom of the card for the set logo and player position. I appreciate the judicious use of foil here, though I think the player name could have used a touch of foil too. One completely unique addition to the card is the bar code at the bottom right corner. This definitely adds to the ticket look of the card. And the numbers beneath the bar code depict the player's birthdate. Pretty cool! The back of the Contenders card has a full-color design. It's good to see that from Panini as many of their card backs primarily use white backgrounds. 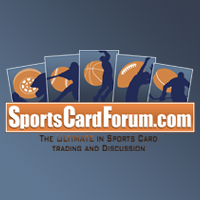 The card back gives collectors information about the player in a short write-up. There are no stats to speak of on these cards. Sorry stats guys! The non-autographed rookie cards share a similar design to the standard base cards with just a few aspects differing. These cards have an added RC logo, a foil rookie designation instead of the position they play, and silver foil numbering to 600. The autographed Rookie Ticket subset has a design that is a bit more different than the standard base cards, but they obviously share many of the same characteristics. The main differences are that the Rookie Ticket cards have a large whited-out area for the autograph. The autograph is on-card and in blue ink. Like in years past, Panini has chosen not to number these cards. By doing this, Panini creates a bit of a mystery in terms of each card's print run. Collectors are always curious to know which cards have been short printed. The boxes of Contenders states that they will have at least 3 autographed cards within. From what I have seen so far though, collectors can almost expect to find more than that. 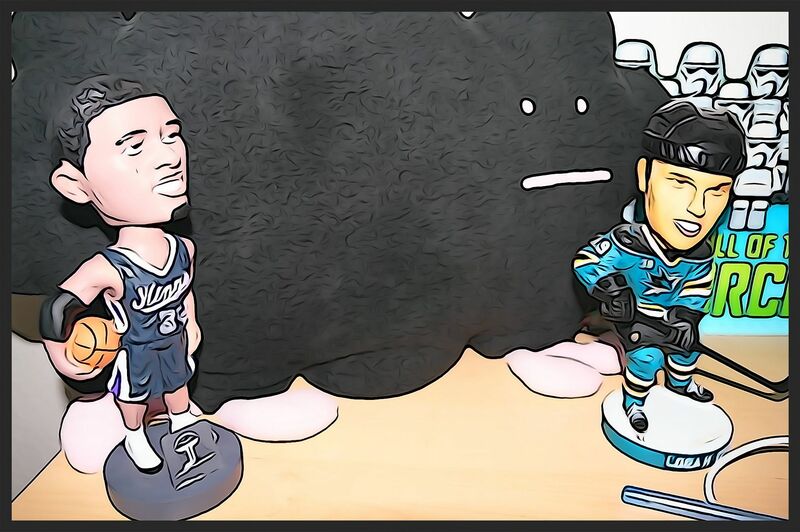 With Panini leaving the hockey card market soon, it looks like they have put as much as they could into Contenders. Contenders has always included specially themed insert cards in the set. Cup Contenders cards highlight players that are contending for the Stanley Cup. These cards are limited to 499 copies of each. 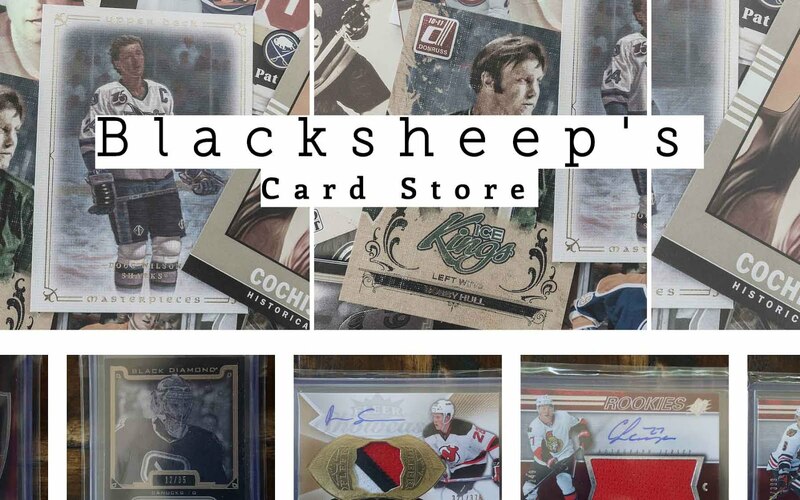 Collectors who enjoy seeing the Stanley Cup on the front of the card (I know plenty who do!) will like this set quite a bit. A signature patch version of some of these cards are also available to be found in boxes. They are limited to just 25 copies with a 1/1 version also produced. Vezina Contenders cards are for the goalie lovers out there. 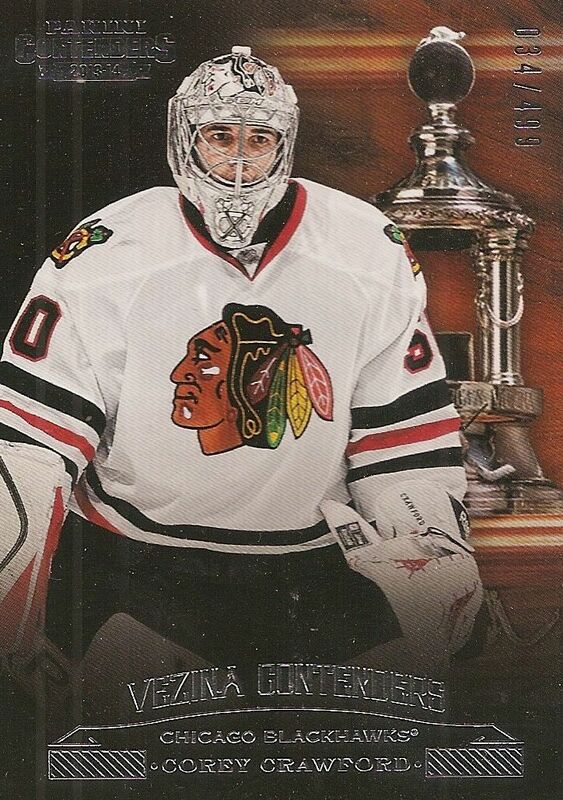 Like the Stanley Cup Contenders cards, these cards have the desired trophy in the card's background. 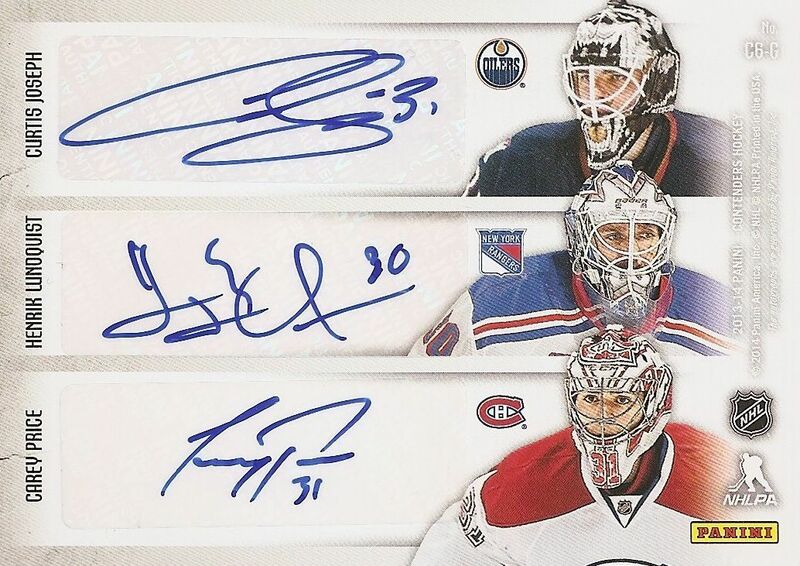 Vezina Contenders are also limited to 499 and have patch auto variations. 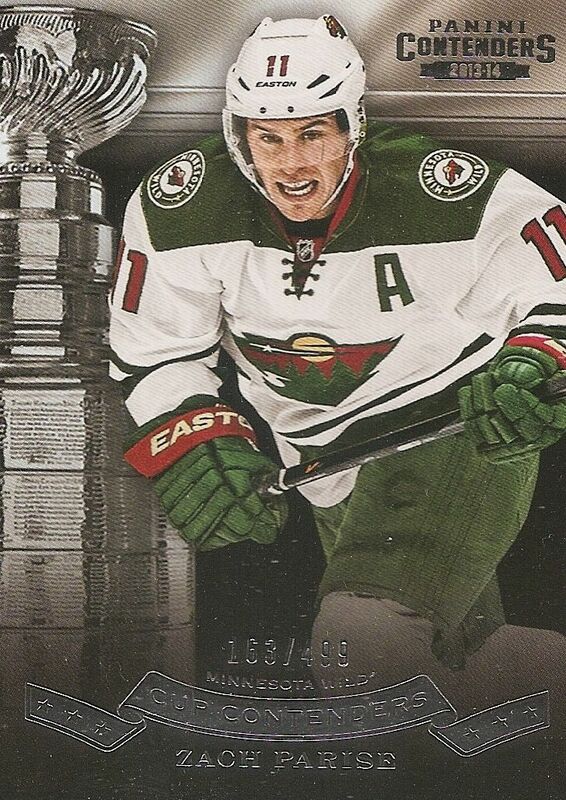 Collectors will also find other trophy themed inserts in their boxes of Contenders this year. If you're into the NHL awards, this set is definitely for you. 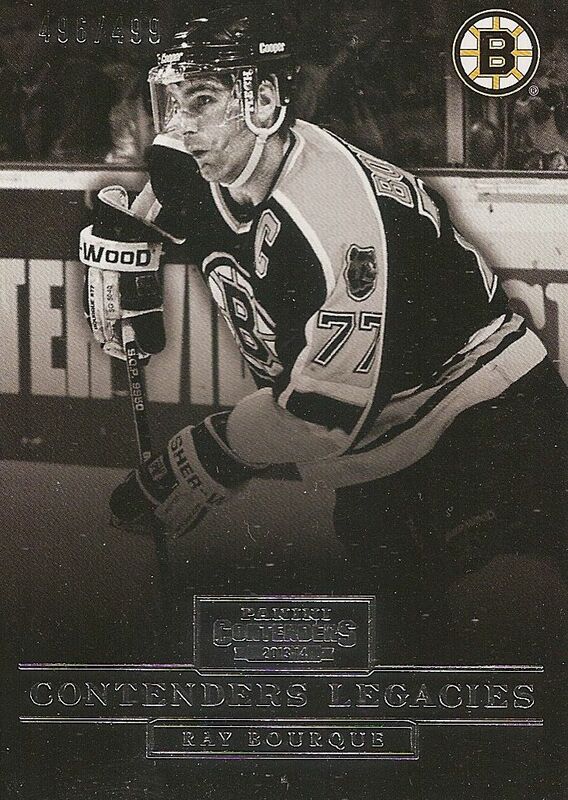 The Contenders Legacies cards are beautiful black and white depictions of NHL legends. The black and white photos give these cards a very classic look. The standard Legacies card is numbered to 499, but the patch auto variations are limited to only 5 with a gold 1/1 version available as well. This is a simple and elegant set that I really love the look of. 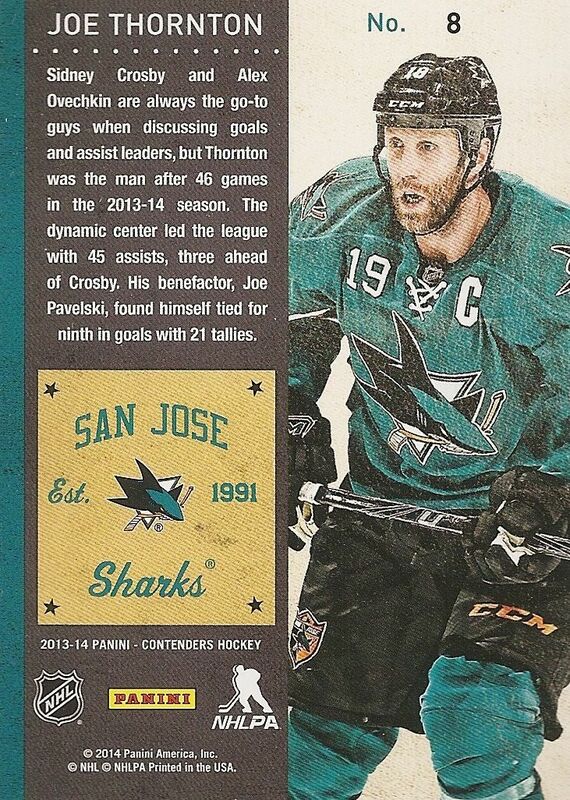 Many of you will remember the Classics set that Panini released during the 12/13 season. 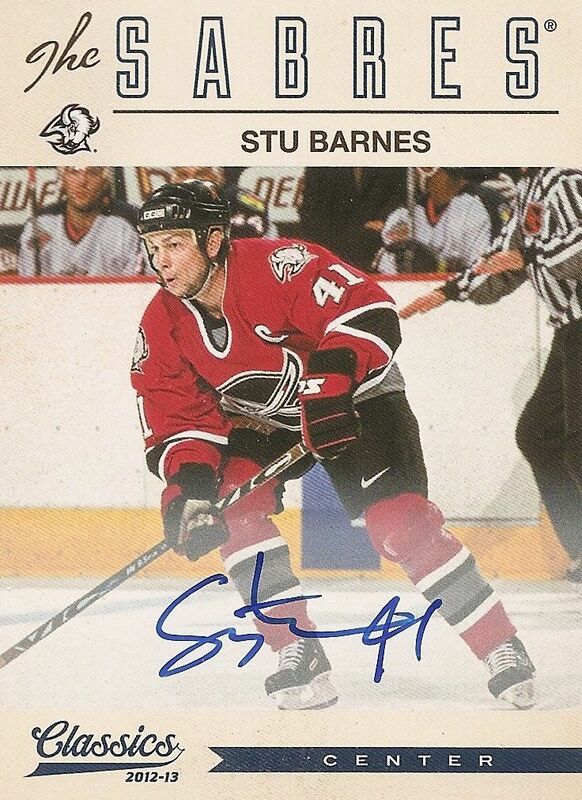 It featured a retro design with on-card autographs of retired NHL players. Well, it looks like Panini had some left over or that came in late... so here they are! Like what Upper Deck did with SP Authentic last week, Contenders is a place to find cards from previous releases. 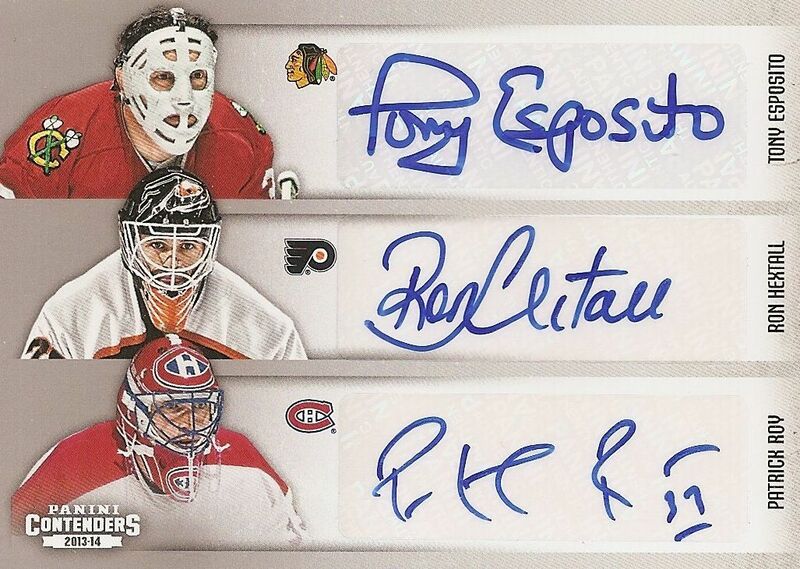 The best card of my box was this six-way autograph of some legendary goalies - Tony Esposito, Ron Hextall, Patrick Roy, Curtis Joseph, Henrik Lundquivst, and Carey Price. It is an amazing card to have and to hold in hands. Rather than being in book form, the card is simply double sided. I actually much prefer it this way than in a book. It fits great in a 35pt. magnetic top-loader. I love this card and it will be in my personal collection. Panini has really put everything they have into this product. I know I got a great box, but I also know that many people have been pulling great things out of this product. There is so much crammed into Contenders this year. Watch break after break of it and you'll see! I usually compare Contenders with SP Authentic. I just makes sense to do so! And normally SP Authentic comes out on top... but this year, I have to give it to Contenders if you're looking for a break that will deliver you some awesome hits. Contenders boxes are just spilling out all kinds of amazing things, and it'd be a great idea to break as much of this as you can! I would still hold SP Authentic in a higher regard in terms of its overall look and design, but Panini Contenders this year just brings it hard with value... and it's not like the cards are ugly... they look good! Contenders is a product you just have to break if you can afford to. It's really good this year as seen by my break as well as numerous others. Go find some and crack a box or two (or more!)! I really like the look of the new Contenders and that six Auto goalie card you hit is incredible. very nice design of the base cards and nice autos as well! Panini is loading there last few products. First anthology now this. Wow. Sick card btw. Yt:christiantlegault. When you broke RA and gave it a 9/10 I commented wondering what would get 10/10. I feel that this box deserved it. That six way auto was sick!!! I like the look of the base cards and you also had a good amount of hits in that box. I've always liked those Panini classics auto cards. wow, congrats :) glad u got the Couture base aswell! I have got to say, of all the reviews and breaks you have done in the past, this one is up there with my favourites. Obviously, the box helped since it was so good but I also agree with everything you had to say. Panini really stepped it up and made this product a good break for your buck. And it has lots of packs and different sets making it very fun to open. I would say it beat SPA this year. My favourite part of Contenders this year would have to be how many different 4-way, 6-way, and 8-way autographs there are. They are very common in the sense that they are not too hard to pull. However, not common in the sense that they have no value. I believe since there are so many different sets and players, it doesn't effect the value at all. But I suppose only time can tell. For now, I can confidently say what they have done with all these multi-player autograph cards is outstanding! I would also have to agree with you that the design is very nice. Not extrodinary, but nothing wrong with it either. It doesn't exactly pop, but that is good in it's own way. Sometimes I find that cards that are too flashy kind of just ruin it all together. Contenders managed to make their design very clean and well rounded. I believe the most flashy set in this product would have to be the Global Contenders set #'d/25 which is a beauty. They are very nice. I'm not sure if you've had the chance to see one yet as they are rare but if you haven't, look them up, I think they are very nice. This was another great review, Luke! Great job! You make the hobby even more fun for everyone! No need to enter me into the contests any time I comment. I just like to participate in the conversation of the products. I'm sure someone else would be much more excited to win. sweet hits this is always been a cool one to get with the ticket base and its always been a get product. Yes...I expected this to be the best product of the year, and I'm definitely proved that I'm right! + It's LOADED with hits! + The Rookie Ticket Signatures set is much bigger than the Future Watch set in SP Authentic. In that way you can get more autos from the Double Rookie Class! + Every single box seems to hold a gigantic card, like the six-player auto which you got in your box. - I liked the design of the cards better in 11-12 than this year. That year escpecially the rookie autographs were sick looking. nice cards and awesome Six way auto!!! 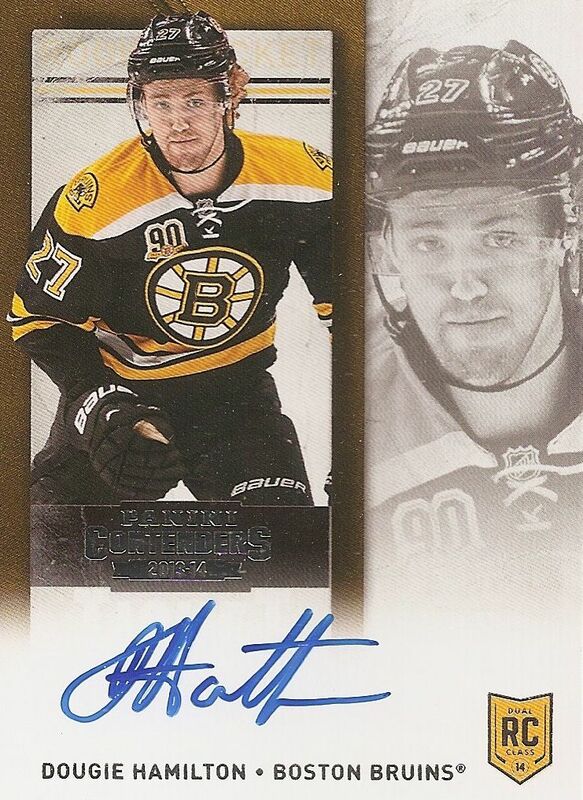 To me contenders hockey was always Panini's version of Upper Deck's SP Authentic. Well there is clearly one winner out of this duel. The amount of patches and multi auto's per case is astounding. Panini really put a lot of interesting cards for what I think is the best year so far for Contenders. I think that this product is great. I absolutely love the design of the multiple auto cards, and there seems to be a great value packed into each box. Also nice to get the update cards into the mix also. This product is loaded. 10/10 is an appropriate score. I don't think there is a better product out there. So much win. absolutely loaded product, panini is just getting rid of all of their sticker autos with these multi-player autos, thats what it seems to me, i like it, might have to get myself a box! I'm going to have to go out and get a box for myself. great review. Great exit on hockey by Panini! Wonderful product. I think that this is a very cool product ! I love the drsign of the cards but panini has definately amped up the quality of the hits which is very nice. For example, the quad autos, triple autos, etc. very nice goalie auto pull ! Forgot to add my youtube name, reposted it below. Sorry if my comment went through already it said it didn't but great review and box.